This post will specifically be mentioning plot points for the third and fourth episodes of the fifth season of HBO’s Game of Thrones. The reasons for talking plot points will be obvious. If you’re not caught up on the series, I recommend that you do so, since the show is great, and there’s no need to read my tale of woe. A few weeks ago, I posted an article talking about the screener leaks of the first four episodes of this season’s Game of Thrones. That post was only vaguely related to the show, I was focusing on how people viewing the illegal material were describing their activities in show-related terms. As I mentioned in that post, while I was developing that article one of the Game of Thrones reporters I follow on Twitter announced that someone was spamming out details from the leaked episodes. And shortly after, I was the lucky recipient of one of those tweets. Since the episodes hadn’t been aired yet, I included heavily redacted images of the warning I received and of the actual spoiler tweet itself. But now that the final early-release “Sons of the Harpy” episode has aired, I wanted to talk about the leaks in more detail. Just because I find the entire situation fascinating. If you have no interest in reading about this I totally understand. Also, if you’re not up to date on the current season, what are you doing reading this? Stop and enjoy the series. This is a precious moment where even book readers familiar with A Song of Ice and Fire can be shocked or surprised by twists and turns on the television show. Don’t Get Spoiled! And Call the Police! The Humans are Giving Me a Bath! The Fiends! Let’s work up the timeline. Before the season started up, HBO made standard-definition screeners available for reviewers to get a preview of the first four episodes. The Thursday before the premiere weekend, those four episodes were leaked on torrents sites and made available in the wild. There are worse things in life than having a television show spoiled, I know. And there was a short duration that spoilers would be in play. Once the first episode aired, someone who didn’t wish to be spoiled just had to be nervous for three weeks. Theoretically, one could just check out of the Internet for three weeks and be safe. I’m kidding. Obviously that would be torture. Right? I’ve read the books, and in general the slight deviations that the show has taken have not been that big a deal. In general, it hasn’t been hard to guess how the show would cleave back to the book series’ narrative. But this season was advertised as having significant changes from the books. We book readers had a chance to be in the dark somewhat, and to be honest, I’ve been a bit envious of my show watching friends who were experiencing the story firsthand on Sunday night HBO. So, I was hoping to be surprised. On April 18th, Joanna Robinson (who writes about Game of Thrones for Vanity Fair, and co-hosts two podcasts about the show (a non-spoilery and book-spoilery one)) tweeted out this alarming news. Now, maybe it serves me right. 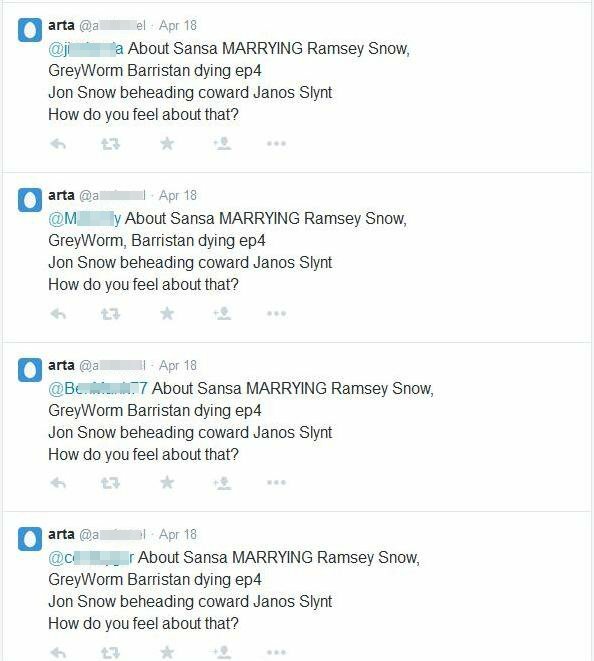 In my reply, I did compare this person “Arta” to someone worse than the Freys. I’d like to humblebrag and pretend I was targeted because I have a Game of Thrones blog, but not even my dad would believe that. I’m convinced that because I commented on Joanna’s thread, I got to enjoy my own slice of spoiler pie. 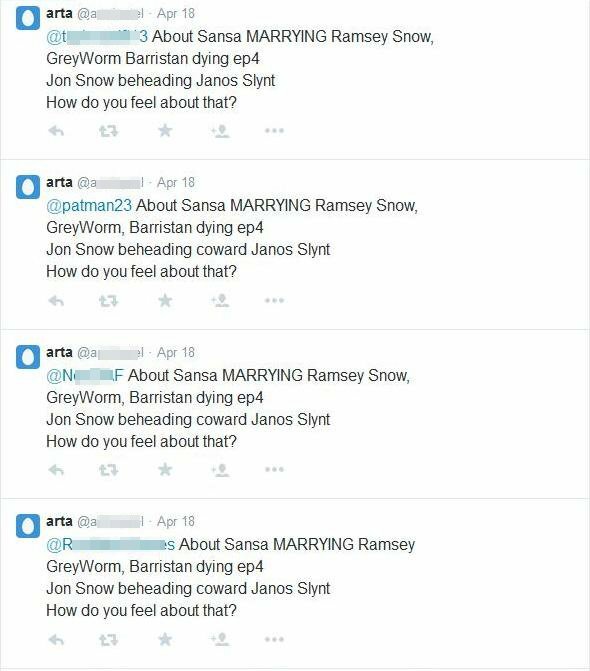 They also got a tweet from Arta with the spoilers. How do I know that they did? I’ll get to that in a moment, but I wanted to comment on some things I’m doing in this post, in regards to Twitter handles. In general, I’m pixelating out the Twitter handles and images of the people involved because, I don’t know, I guess I’m trying to be respectful of them, to not just expose it to anyone not willing to dig deeper. Twitter is wide open, so if anyone cares, they can just go to Joanna’s Twitter page and get the first-hand story. I’m not redacting Ms. Robinson’s details, because she’s as unbreakable as Kimmy Schmidt and can handle herself in Twitterspace, dammit, but I felt that without some kind of verifiable reference point this article would just be me talking a lot of smack. So, why aren’t I redacting out all of Arta’s information? I was on the fence about this. I don’t really owe them anything, I am a bit annoyed at them, etc. and I wanted to have something to call them, so I opted to pixel-out their official Twitter handle, but include their screen-name for me to have something to refer to. 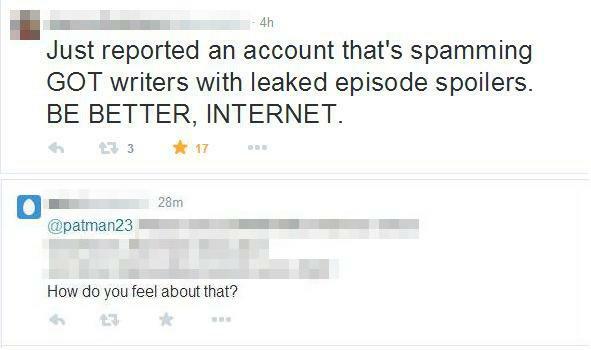 And I didn’t see a need to reward their Twitter account with attention. I mean, why give them exposure and advertising? If half an onion is black with rot, it is a rotten onion. Melisandre might disagree with me since she’s all about the extremes, but I felt Arta wasn’t doing a great job spoiling, only half-way spoiling. Okay, if I want to be mathematical, this was only 75% spoilery. I’m a book reader. I don’t care if someone is going to give me book details. Sansa marrying Ramsay (not Ramsey) Bolton – that’s a spoiler. 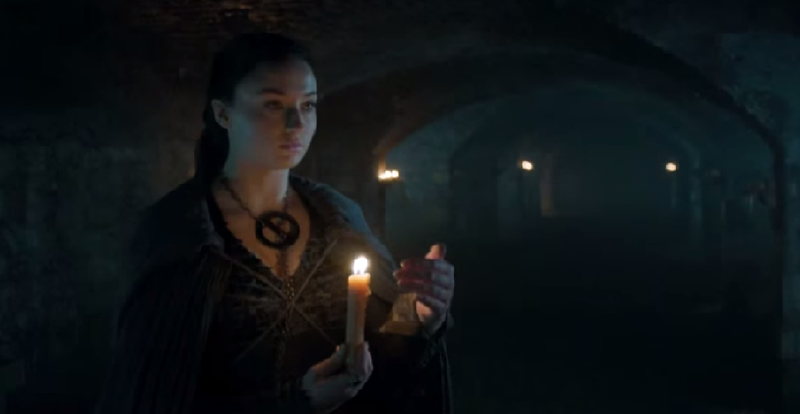 Although since we’d seen Sansa in the crypts of Winterfell in trailers, and since it was unlikely we were going to get Jeyne Poole suddenly introduced pretending to be Arya Stark, there had been speculation along these lines already. Grey Hair and Grey Worm. Together They Fight Crime! 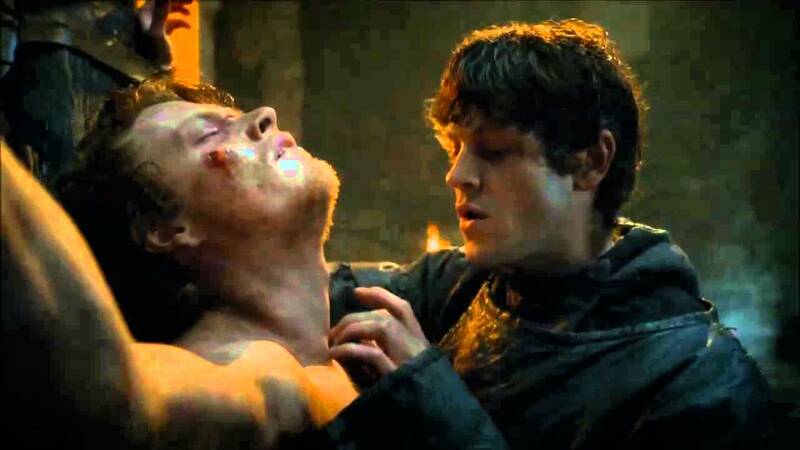 Grey Worm dying – that’s new. And that’s IF he’s dead. Since Arta gave me the unwelcome heads up, I was expecting how the fight would play out, but I’m not ruling the Unsullied out, yet. Barristan Selmy dying – that’s new too. It seems more likely that Ser Barristan won’t survive. I wasn’t expecting either of them to die, and probably would have been shocked by the fight’s outcome had Arta not clued me in. Harrumph. But in general, these two had been on “who’s going to die this season?” lists, since GRRM had implied that the show runners were going to be reaping a lot of still-living characters from the books. Wait! I’m a book-spoiler, not a leaked screener spoiler! I SHOULDN’T EVEN BE HERE! 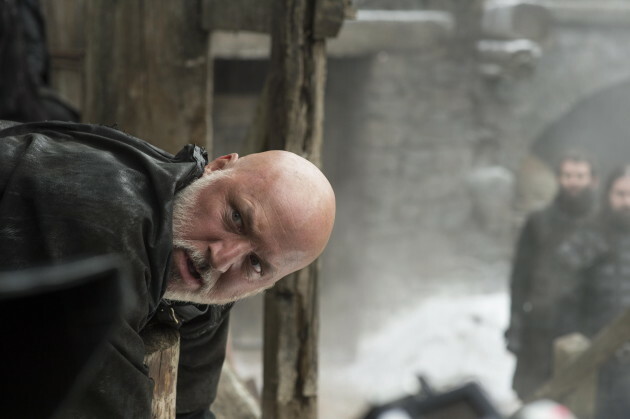 Jon Snow beheading Janos Slynt – that’s not a spoiler. Something like “Janos Slynt beheading Jon Snow” would have been a spoiler, man. But Jon takes off Lord Slynt’s head in the books. It was just weird that it wasn’t all new show-material details. My assumption is that Arta isn’t a book reader. I could certainly be wrong, but in most things, book readers have been pretty good about keeping shocking details quiet. And I’m not saying that because I think book readers are noble or whatever. I think there might be an evil joy obtained from observing the shock of the innocent show watcher. Tell me again, how Obi-Wan assured you that the Viper could not lose to the Mountain. Is Arta engaging in some kind of Revenge of the Sith Show Watcher wish-fulfillment? I have no idea. But Arta was certainly on a roll in their quest to spoil. -was to go to their Twitter page, and check out their tweets/replies. This is how I found out that they’d sent spoilers to the account of the person who had been angry and scared of getting spoilers, and had said as much in reply to Joanna’s original alert. Along with many other accounts. It was quite interesting. Particularly because Arta opted to seed in a fake spoiler at one point. 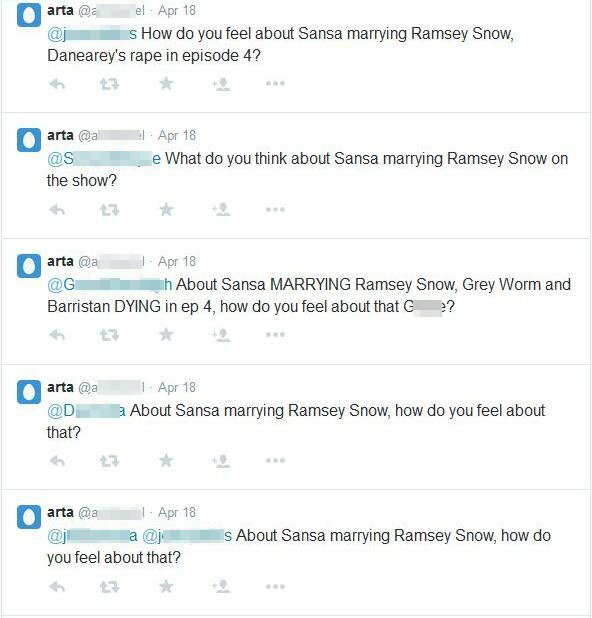 “Danearey” (we’ll cut Arta slack on spelling, since they can’t handle Ramsay) experienced nothing like a sexual assault in the episode. Over the course of April 18 and 19, I think I counted sixty or so people who received more or less the same spoiler info. Reviewers, celebrities, companies, NFL athletes. It was quite a diverse group. And then it stopped. I can only assume that Arta wasn’t getting the attention they wanted? Or they’d spammed just the people that they wanted? I don’t know. I’m just glad they stopped. In general, I don’t even know if Arta and their spoiler-spam was worth the afternoon it took to compose this post, or to obtain and redact the tweets appropriately, etc. It just seemed like a thing to do. And now that’s done. The television show has now caught up with the screeners, so the Spoiler Defcon level has returned back to normal. And by that I mean that show watchers can continue to live in fear that book-readers will send them tweets full of spoiler details. I make no claims to the artwork, but some claims to the text. So there. Well, obviously not the tweets that I was featuring that didn’t originate from me. If you liked this article, thank you! I have all of my Game of Thrones related articles on my handy-dandy Game of Thrones page should you want to read more but don’t want to navigate around my site. Most of my articles are about the show, and not about some troll spamming stuff about Game of Thrones. This post was somewhat atypical of my usual style. I’m trying to think of a time I was spoiled and it annoyed me.. but I don’t think it ever has annoyed me. In fact sometimes I spoil myself deliberately. 🙂 This might be a living in Australia weirdness, though. 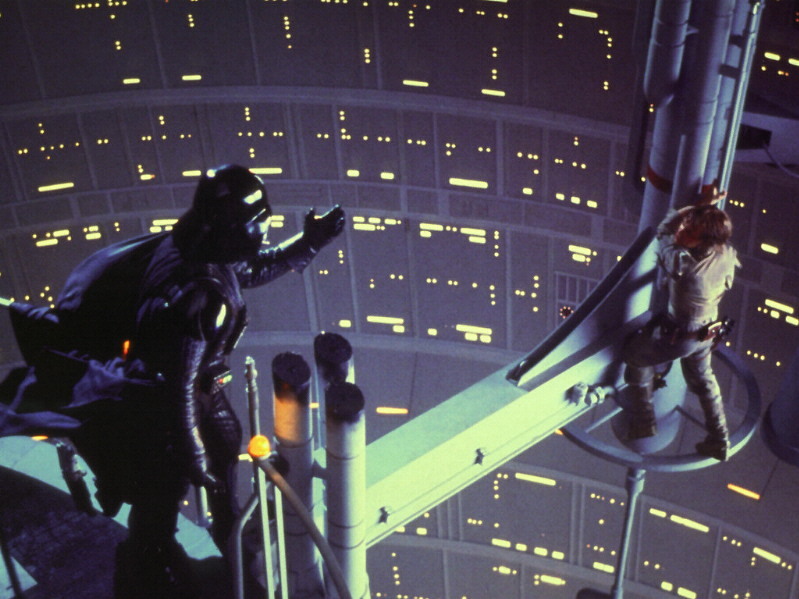 My wife still tells the tale of when she was in line to see The Empire Strikes Back, on its first release. While she and her friends were in line, someone drove by the line of movie-goers yelling [SPOILER ALERT IF YOU KNOW NOTHING ABOUT STAR WARS…. My twitter account is on private for personal reasons and I don’t have tumblr, so I managed to stay show unspoiled. So I can say that the last fight scene was incredibly tense because I had no idea what was going to happen. People who spoil things on purpose are the worst, and my brother (who hasn’t read the books) asked me if it’s true that a certain character dies. That incident hasn’t even happened in the show yet, so while it’s reprehensible that people were spoiling things from the first four episodes, they were also using that cover as a way to spoil things that happen later in the series, if they happen at all. One thing that annoys me is that the writer or one of the producers did an interview with EW and then one of the writers at Vox.com put it up on their site, so I now know Barristan’s fate. I feel like if it wasn’t definite in the episode, it would have been answered the week after, so there was no need to do that interview. Alan Sepinwall over at HitFix has been spoiled on the show so many times by either book readers or people who just look everything up on AWOIAF. I think there was someone tweeting at him whose handle was @joffreydiesathiswedding or something like that, and a genuinely innocent person emailed him to ask why Stannis didn’t show up at the end of “Watchers on the Wall”. On a personal note, I am guilty of spoiling myself on things, and it’s really difficult to watch LOST unspoiled. I mean I knew there was a hatch, and there were numbers and that Michael Emerson’s character WASN’T called Henry Gale, but I’ve tried my hardest to stay away from specifics. People who spoil are assholes, pure and simple. Sorry that this happened to you Patrick. 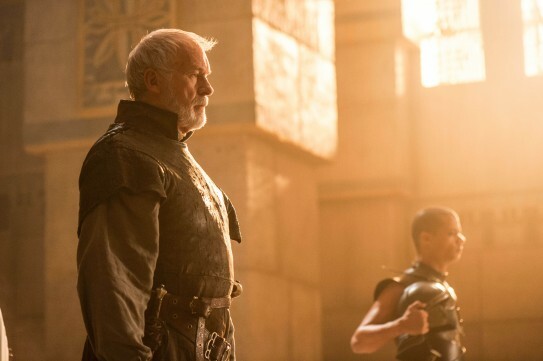 It would be cool to hear your thoughts on what they did with Barristan and the Unsullied. Personally I was shocked like I’ve been so many times watching this show, but for the first time it wasn’t in a good way. I can grudgingly accept that Barristan would fall to so many knife-wielding thugs due to sheer numbers, but I will not accept that the scene was purely there for shock value and made no sense in terms of writing. Why would you hype up this guy for 4 entire seasons, only to have him cut down ~10 hoolligans and then fall? It felt like he had a greater part to play in the wars to come. Barristan’s actor appeared on Thronecast (this discussion show on Sky Atlantic in the UK) and said when he saw his schedule was 5 weeks instead of the usual 8 this season, he knew there was something wrong and even tried convincing D&D not to kill him off. That there was so much more he could’ve done. It’s disappointing Walking Dead-esque shock value writing. All this though I can accept. But to watch a good chunk of Unsullied being defeated in frontal combat by a group of fanatical knife-toting crazies, without the Unsullied retreating down the corridor from which they came (so at least they could fight more in the open courtyard and the spears would be more effective I’m guessing), OR USING THEIR SHORTSWORDS or– I can’t even fathom it. sigh. Lol. Ah, my thoughts on Barristan and the Unsullied, fighting the Sons of the Harpy. I have some complicated thoughts, and I’ll probably write something up after the season when I start in on blogging. My initial reaction would be that the Sons are chosen from those that have fighting experience, either bodyguard of the Masters, or criminal enforces, or sellswords, or ex-slaves who were gladiators, and the opening of the fighting pits could offer them opportunities. I’ll have to think a bit about this. And the fact that maybe the Sons are ex-gladiators or something along those lines makes a lot more sense too. Not enough, but still some :P.
Cheers! Looking forward to more content. Reminds me of the line in “The Dark Knight”, about the thief who didn’t actually want to keep the rubies he stole and how some people “just want to watch the world burn”. Then of course, besides obvious losers with too much time on their hands like this Arta, accidents on the internet do happen. I Just realized that the first few lines in each of my blog post I link to on facebook about the show also show beneath the generic S5E1 (or whatever) title and so have to be kept clean. Watching the world burn does seem about right. Particular because it was this big manic burst of spamming. I don’t understand the mentality of someone who spoils stuff like that for other viewers. Like, is there any rationale, or justification, for what they’re doing? Do they just revel in being jerks? Eh, I don’t get it. Yeah, me neither. Thanks for your comment, and for the compliment about Chi Chi. Sorry doing this on my phone. Was going to say, I don’t actually mind having plot developments spoiled for me. I’m just happy to watch it all go down. I’ve read the books so I figure I’ve spoiled myself, kind of! Although I was shocked by that last fight scene too. I don’t remember that from the books. If my husband was watching GOT with me I’d probably be spoiling away because he hates that and it’s fun to annoy him. Chi Chi is so cute!! 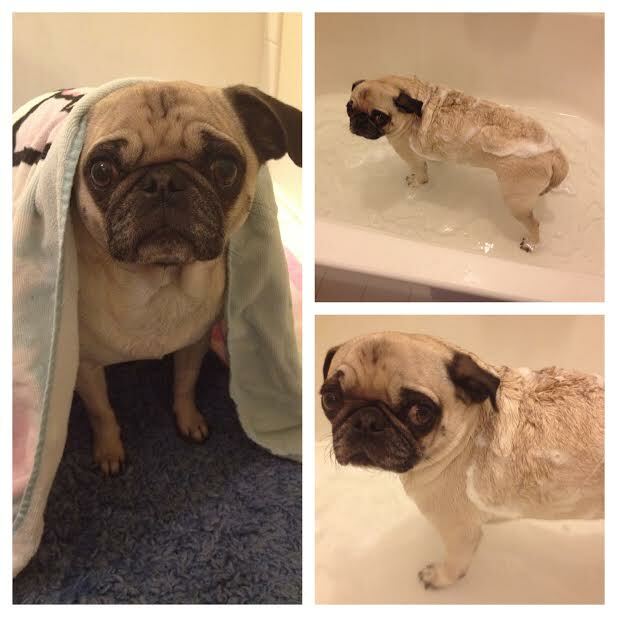 Thank you so much for your kind words about my ridiculous pug. And thank you for your feedback in general, especially about how you feel about knowing plot details. 🙂 thanks for the feedback. At least we’re now past the screener leaks. The worst GoT spoiler I received was from a friend way back in season 1. I have since read all of the books, but at this point I had no knowledge of what was to come. My friend had just finished watching the first season of the show and I was playing catch-up. That is by far the worst GoT spoiler I received. I’ve never forgiven him for it. The worst part is that he has a track record for spoilers dating back as long as I’ve known him. It’s like a disease. He told another friend of mine about several deaths later on in the show that he knew about from the books. Ugh, that’s really rough. Most people with book knowledge kept the Ned secret a closely guarded secret, because, well, Secret!